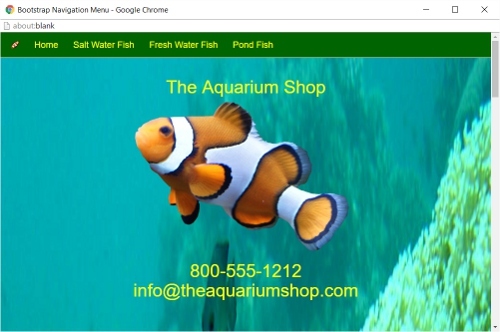 Create your first responsive navigation menu while building "The Aquarium Shop". This re-usable menu will allow your users to navigate single or multiple page websites with some minor changes. In the lesson series you will build a "single page website" with all the content on one page. This is popular for mobile presentations. In the developer challenge you will use the same content to create a more traditional "multi page website". How to add a navigation bar. How to customize the background color and font. How to add a menu icon and HOME option. How to add menu options to navigation. How to use "page anchors" in a menu to navigate a single page website. How to create a traditional mulipage website. You will create a multi-page website of your choosing. You can pick the theme and determine how big or small you want it to be. Customize the menu options to support it.